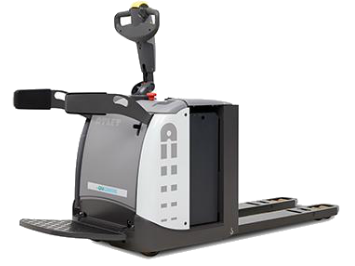 Featuring a robust fold-down driver platform and foldable protective sidebars, the Atlet Presto PLP pallet jack allows for long travel distance and extended work cycles for quick pallet handling. The Presto PLP pallet jack is great for intensive, high throughput operations. It can be used for loading/unloading, internal transportation, and handles all types of pallets. This quick and powerful lift truck, with a 5-point chassis, provides top-quality stability (even at high speeds). The low chassis prevents foot injuries, and the compact design enables the truck to manoeuvre in tight spaces. Servo steering is optional on the PLP 200 pallet jack, but comes as standard on the Presto 250 pallet truck. A fixed driver-protected platform is optional. The five-wheel design combined with Friction Force technology gives both high lateral stability and excellent traction. Other features: Atlet Modular Concept design for highest First Time Fix Rate. AC motor for reduced maintenance plus maximum acceleration and drive speed. Five-wheel design for maximum stability. Patented 4-point Friction Force chassis for improved stability and traction. ATC truck computer with PIN code access for onboard diagnostics, optimum performance settings and preventing unauthorized use.